In a new report done for Congress by the National Defense Strategy Commission they report that the US could now lose in a war against China or Russia as 'America's military superiority has eroded to a dangerous degree' according to this Daily Mail story. Though the US potentially losing a war to Russia or China shouldn't be any surprise to ANP readers as we've been reporting for almost a full year now that MAD, 'mutually assured destruction', is no longer mutual thanks to Barack Obama's New START nuclear weapons reduction treaty. 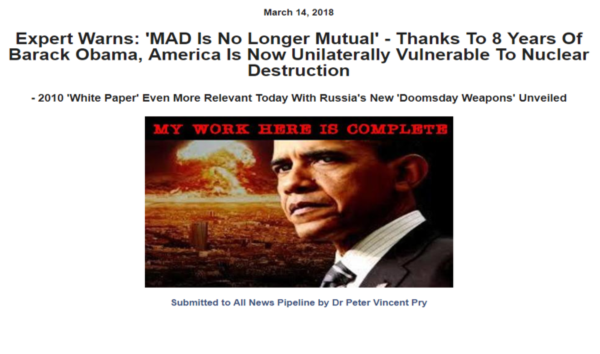 As Dr. Peter Vincent Pry reported on ANP back on March 14th, thanks to Russia's new 'doomsday weapons' and the U.S. failing to develop such weapons, the US "no longer has the ability to deliver 400 equivalent megatons (EMTs) to destroy 25% of Russia's population and 75% of industry after a Russian first-strike, which is the classical definition of MAD requirements for the U.S. In contrast, Russia--after a U.S. first-strike--has the capability to destroy more than 25% of U.S. population and 75% of industry by delivering 100 EMTs against the U.S., whose population and industry is much more urbanized and concentrated than in Russia. U.S. population and industry is also much less well protected." And while the Daily Mail story attempted to blame President Trump for the US falling behind Russia and China, as their story pointed out, the Congressional commission "lambasts 'political dysfunction and decisions made by both major political parties,' especially budget control measures implemented in 2011." And though we're happy to finally see the mainstream media reporting upon this development that should keep some insane US politicians from pushing for war with nations that could wipe us off the map, as we see outlined within this ANP story, many believe that judgement is already being carried out upon America due to the sins of our past leaders and much worse may still be yet to come. In this November 4th story over at Business Insider saved at Archive they reported that a number of different Russian media outlets had published at least 30 different stories over a several day period prior to the mid-term US elections suggesting that America could devolve into civil war sometime during the 2020 election. With those coordinated stories reminding us of the coordinated efforts we've seen here in the US with the mainstream media consistently aligning upon story narratives while working their very best to divide the American people as Susan Duclos reports in this new story on ANP, the Business Insider story interestingly points out that the purpose of the Russian medias stories are an attempt to portray the American people and therefore America as divided. And as has long been warned, a nation divided cannot stand. And while all of the Russian outlets used this opinion piece published by the Boston Globe by historian and Conservative commentator Niall Ferguson of Stanford University as their source, and in his story, Ferguson argues that America is already in what he calls a 'cultural civil war', being played out on social media websites, the Russian outlets failed to mention Ferguson's conclusion, that he believed a 'kinetic' civil war in America is highly unlikely and for many different reasons. Yet as the Business Insider story correctly pointed out, another civil war in America would play directly into the hands of Russia, Russian president Vladimir Putin and any other enemies of America who might want a 'weakened America', and a divided America. And that includes the 'enemies of America within' who've long been working to take down our nation and merge it into their satanic new world order. As we hear in the only video at the bottom of this story featuring Steve Quayle on the Hagmann and Hagmann Report, while the globalists are attacking nationalism, they are also going forward full speed ahead with their globalist agenda despite what President Trump is attempting to do for America. And so they continue to push us towards destruction with most Americans completely unaware of what's really going on. And with record cold weather now being forecast for the East Coast as this November 12th story over at Ice Age Now had reported and winter storm Avery pummeling the East coast, bringing ferocious winds, ice and snow here while California goes through truly Biblical fires on the West Coast, we couldn't help but notice the incredible similarities between what is happening now to America and this prophetic word from Steve Quayle dated all the way back on April 15th of 1994. Within which Steve was warned of events just like these happening now as God delivers judgement upon America. As Steve tells ANP, "the word normal is gone forever". 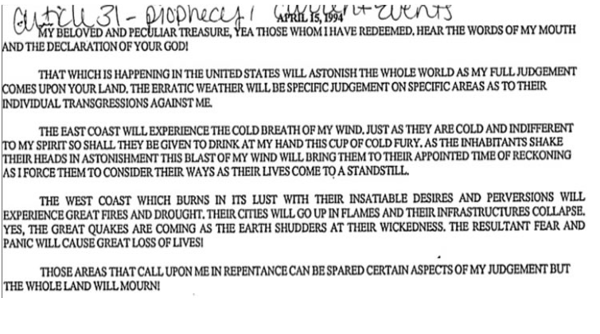 A partial screenshot of Steve's 1994 Prophetic Word is here with much more below. As we see in the next screenshot below, Steve was also warned then that all of the little skirmishes that we're witnessing around the world now would one day turn into huge bloody battles and explosive wars and with them, entire financial systems would come crashing down. 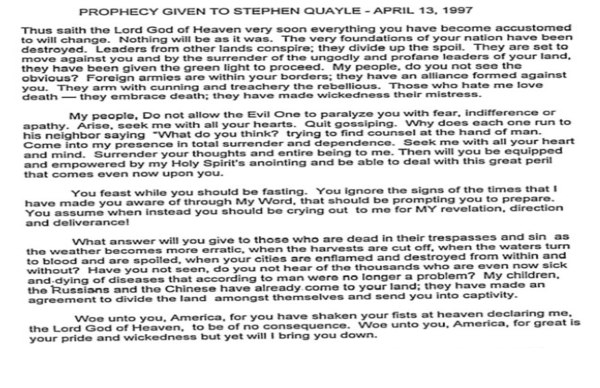 Warning also of judgement coming not only to America but to the entire world, Steve also mentioned global government, this back in 1994, long before the confirmations we've gotten of such government existing in 2018, though the mainstream media still runs gatekeeper. And on April 13th all the way back in 1997, Steve was warned that everything we know about America would soon change and nothing will be as it was with the foundation of our nation destroyed. Warning that leaders from other lands would conspire against us and divy up the riches of our lands, we've seen just that in the 20+ years since as America has been sold out to the highest bidders, damn the American people and our nation's sovereignty. Also warning all the way back then of foreign invaders at our borders and the Russians and Chinese scheming to take parts of America, we've seen just that with convoys of thousands of people rushing up to America from the south while China owns huge chunks of land in America already, including a big play made by them back in 2016 to buy up American farms and farmland. And while we haven't yet witnessed an outright kinetic invasion, should America further fall into disarray and division as the 2020 election approaches and tensions heat up once again with America seemingly never more divided than we are now at any point since the Civil War, is it too much of a stretch to suggest that our enemies are just silently waiting, ready to pounce upon us? As the American Thinker reported back on October 27th, the United Nations wants to be our world government by 2030, just over 10 years from now, and the UN has previously made it quite clear that they'll be happy to jump into the skirmish should widespread hostilities break out in America. So we join Steve Quayle and pray for strength and redemption for America and Americans in the days ahead and ask ANP readers to join us in asking for God's protection of the first 'America-first' President that our nation has had in many, many years in President Donald Trump. And we pray for the people of California who are now suffering tremendous hardships while wondering if what we are really witnessing is His Judgement upon our land for our leaders sins and if so, how much more will Americans have to bare in the days, weeks and months ahead? As Steve mentions, our world under judgement is accelerating beyond what most people can even embrace.